Willow and Rowena sat working at a large table sitting under the exterior window. The blinds had been pulled open to allow the weak afternoon light to enter, but high intensity lamps were still needed to work by. Strewn over the table between the two women were several manuscripts, a pile of what appeared to be ancient scrolls and, as if to contrast the antiquity of the other materials, Willow's laptop. The redheaded Watcher glanced up from the scroll she was reading when the light from the window seemed to dim even more. "Storm's getting worse," she remarked to her companion, who also looked out the window. "Andrew seemed excited about the weather forecast this morning," Rowena said. "Not too many blizzards for you Southern California natives, eh?" "Hey, watch it," Willow laughed. "Your roots are showing." Rowena chuckled. "Can't help it," she said. "This reminds me of what I grew up with in Nova Scotia. And believe me…this is nothing compared to a real nor'easter." Ro fell silent as the pair watched the falling snow outside. "How old were you when you left home?" Willow asked, turning away from the window and picking up her pen again. "Wow," Willow said, raising her eyebrows in surprised. "That's young." "No younger than our junior Slayers," she shrugged. "And only a few years younger than you when you started fighting the forces of evil." "Yeah, but I had help," Willow said. "I didn't know the old Academy accepted students that young." "It was rare, but it happened," Rowena admitted. "Usually children who come from a hereditary line of Watchers will enter the Academy at that age." "Not in your case, though," Willow said. "You said your father's a fisherman." "Right," Rowena agreed. "But James Tyrell took an interest in me one day when he happened to catch me reading an old book on folklore in the town library. He was there researching the same subject and was amazed when the librarian told him I had the book he was looking for. He spent the afternoon quizzing me. The following year he sponsored me for the Academy and I was awarded a full scholarship." "Nice of him," Willow muttered. "Considering he tried to kill you later on." Rowena grinned. "True, but I don't think James ever intended to kill me. He's a different generation and breed of Watcher. Even different than Giles, truth be told. Tyrell was into procedure and order. He used intimidation but I doubt that would include the murder of a fellow Watcher. His son just took things a bit too far." "Were you two close? I mean you and Tyrell?" Rowena nodded. "He was like a second father to me – a cold, emotionless father," she snorted. "But when you're that far away from home you take what you can get. Besides, my own father spent so much time at sea I rarely saw him when I was growing up. So it was nice having a dad that was proud of me." "You'll have to tell me what that feels like," Willow said with a grin. Rowena didn't say anything but she scrunched her eyebrows in question so Willow went on. "I have an annoying habit of living my life on my own terms, which, believe it or not, is a big letdown to my dad." "I see. Well, James always felt it was his destiny to retrieve the Opus Obscurum," she explained. "When he thought I failed to find it, he was terribly upset." "Why didn't you take it to him?" Willow asked, a curious expression on her face. "I mean you were loyal to him when you first arrived here, but not enough to trust him with the book?" "No," Rowena explained and sighed as if thinking of a way to explain. "I think I had been so busy running from the harbingers for so long that I couldn't stop running. The only one I trusted enough to keep the book for me, for a very short time only, was my friend Althenea in Devon. I'm still not sure it was the right thing to do." "Althenea?" Willow's face went blank a moment as Rowena's grew more confused. "Hey!" Willow suddenly exclaimed. "Willow?" Rowena asked as the witch jumped up from her chair and ran to the front of the library. The blonde followed and watched as Willow pulled a set of keys from her pocket and inserted one of the keys into the locked cabinet behind the main desk. After muttering a soft incantation, she twisted the key and the lock opened with a click. "What's going on?" Rowena asked as Willow pulled the heavy Opus out and began to flip through the pages. "Ah ha!" Willow exclaimed, dropping the open book on the desk. Rowena winced as she watched the book fall and reached out to steady it. "There!" Willow said, pointing to a page. Rowena looked at the ancient text. "The spell to activate the original Slayer," she said. "It's the first magic recorded in the Watchers archives." "Exactly!" Willow laughed happily. "Ro, if you had given this book to Tyrell, instead of Althenea, none of us would be here now!" "Wait…" Rowena held up a hand. "You know Althenea?" 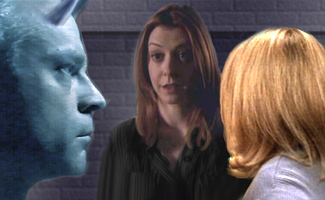 "I spent the summer in England after Tara died," Willow said. "Giles arranged through the Old Council for the Devon Coven to help me learn to control my magic. Al was good to me and we became friends. Giles mentioned that the Coven occasionally trained Watchers in magic. Is that how you met her?" "Yes," Rowena said. "She had just received her first degree. But…" Rowena still looked bewildered. "I'm not following you, Willow. What's that have to do with the book and the spell?" "Last year," the witch began to explain, "Giles and I called the Coven looking for help to activate the Slayers. Althenea gave me this spell." Willow banged her finger against the open page of the book. "But I thought you did that all on your own?" Rowena asked. "Yes and no. I modified the spell from your book a-and used it to activate all the Slayers. But if you hadn't trusted Al with the book, I never would have had the original spell. And chances are we never would have beaten the First." "Oh, wow," Rowena whispered as if finally grasping the enormity of what Willow was saying. "You betcha wow," Willow said with a smile. "Trust your instincts, Ro. They've done a pretty good job so far with saving the world." The two turned at the sound of someone entering the library. "Hope I'm not interrupting something," Tracey said. "Oh, hi Tracey," Willow said as she put the book away and relocked the cabinet. "What's up?" "Hey Will," Tracey replied. "Umm, there's some strange guy downstairs looking for someone called the Red Witch? That you?" "Figured, you're the only redhead here," Tracey replied. "And Andrew said he was studying Wicca with you." "Yep," Willow said. "Thanks, Tracey." "No problem," Tracey's face scrunched up. "Um, that guy downstairs? I think he's on his way to a costume party or something. The blue makeup is obviously fake, but those horns look real." "Uh, yeah," Willow said, uncomfortable. "Yep, that's Brell…he, uh, he likes to go to sci-fi conventions with Andrew sometimes. He must be on his way to one today. Can you show him up here, please?" "Uh huh," Tracey nodded as if unconvinced and then left the room. Willow rolled her eyes at Rowena and shook her head. "Okay not the best excuse but it was all I could think of at the time," Willow said softly. Rowena leaned over and whispered in Willow's ear. "Sooner or later we have to tell her the truth," she muttered. "Shhh," Willow replied with a finger over her lips. "Yes, maybe, but today is not that day." Tracey pointed inside the room to Willow and Rowena. Brell gave her a respectful nod before she disappeared heading back downstairs. Brell walked inside and closed the door as Willow and Rowena rose to meet him. "Red Witch!" he said, taking Willow's hand and kissing it gently. He then turned to Rowena. "Pretty Watcher," he greeted, repeating his previous action. "Brell so happy to see you both, but…" He looked uncomfortable. "But…?" Willow prompted. "Is there trouble, Brell?" Brell nodded. "Brell's brother and wife and spawns just arrived from home. They are running." "Running from whom?" Willow asked. "Brell's brother not sure," Brell replied. "He say invaders have come to my home world and chase them to this new one. He say that invaders want many like our kind, but he's afraid they still chase down the refugees to serve as slaves." "Invaders?" Rowena pondered. "You're not from this world, Brell?" "No," the demon shook his head. "Brell come here many years ago with Clement. We young, we look for adventure. We not know this world not friendly to us, but we like it here. Clement then bring his cousin. Brell like cousin and we settle here; have spawns. Now this place not so safe for us, but better than Brell's world. Brother come here seeking help. Brell can help, but need help from Watchers right now." "If we can, of course. What do you need?" Willow asked. "Brell can get brother and family to safe place, away from Hellmouth. But we have bad storm. Not safe to travel with small spawns. Not safe to stay with Brell until storm goes away. Brell asks if brother and family can stay with Watchers where it's safe?" "You want your relatives to stay here until the storm lets up?" Rowena asked to clarify and Brell nodded enthusiastically. Willow nodded. "Of course, Brell," she said. "They can stay here. You've helped us and we're happy to return the favor." "Thank you!" Brell said, shaking Willow's hand happily. "You're welcome," Willow smiled. "And Brell? Do you think your brother could answer some questions about those 'invaders'?" Brell nodded thoughtfully. "Good idea," he said. "Watchers need to know." He pointed at the small Council crest hanging on the far wall. "Brell return later with brother and family. Thank you!" As Brell left to return into the swirling storm, Rowena looked at Willow. "Are you thinking what I'm thinking?" "That this has something to do with the Presidium?" Willow asked rhetorically. Rowena simply nodded. "Wouldn't hurt to look into," Willow added. "We'd better tell Giles." They turned to leave when the cordless phone at the desk rang. "Hang on," she said to Rowena and answered the phone. "Council of Watchers. Rosenberg speaking," Willow's face mirrored surprise. "Oh Mom! Hi. How are you? How's Dad?" Rowena turned to give Willow some privacy when Willow's tone suddenly changed to near panic. "What?" Rowena stopped and turned around as Kennedy walked into the room. "No, no of course not. I'd love to see you, too. When do you think you'll be getting in?…What?" Kennedy nodded toward Willow. "Who's she talking to?" she asked Rowena as she too was alerted to the distress in Willow's voice. "Not sure but her parents I believe. She keeps saying 'What! ',' Rowena answered exaggerating the word in the same tone Willow was using while her free hand made an urgent gesture. The Watcher and Slayer both cocked their heads as they listened to the one-sided conversation. "We're sorry to arrive unannounced," Sheila said into the receiver, "and when they officially canceled the flight all the hotels were already booked. The worst part is they don't know when we'll get off the ground again," she said as she looked out the window to one of the planes barely visible through the swirling snow. "Well, yeah blizzards and planes really don't go together…Yeah, of course, every room would be booked, people are stuck...uh, okay, yeah sure. What am I gonna say? No," Willow answered with a chuckle although her face showed mild hysteria. "Well your father is seeing about renting a car right now," Sheila began. "No, no I'll send someone," Willow told her. "Not me since, ya know, not too keen on driving in this but…no, not at all, it'll be great. We can catch up and I can show you around the school. Okay. Great…see you soon." Willow hung up the phone and the faux happy expression she wore fell instantly. "Oh gods! My parents are coming!"